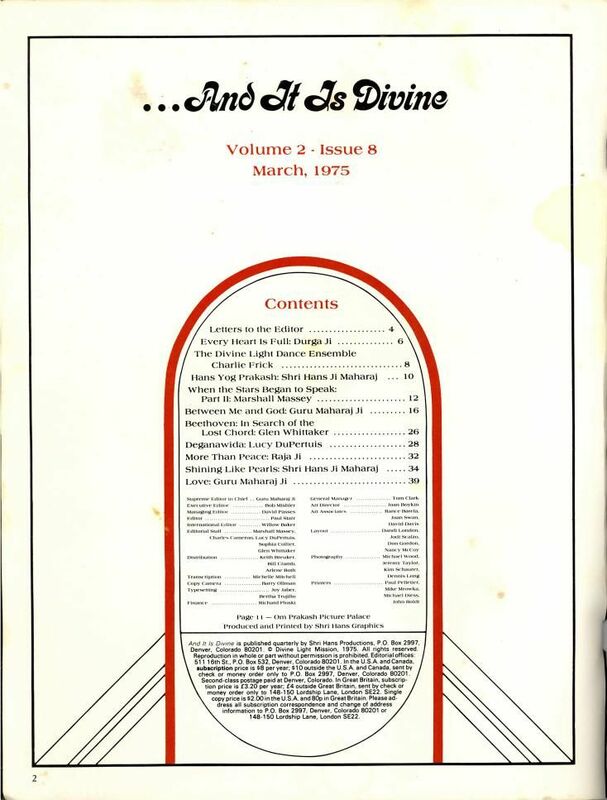 "And It Is Divine" was the name of this colour magazine published by Divine Light Mission in the USA from November 1972 until the late 1970's when it was replaced by "Elan Vital." 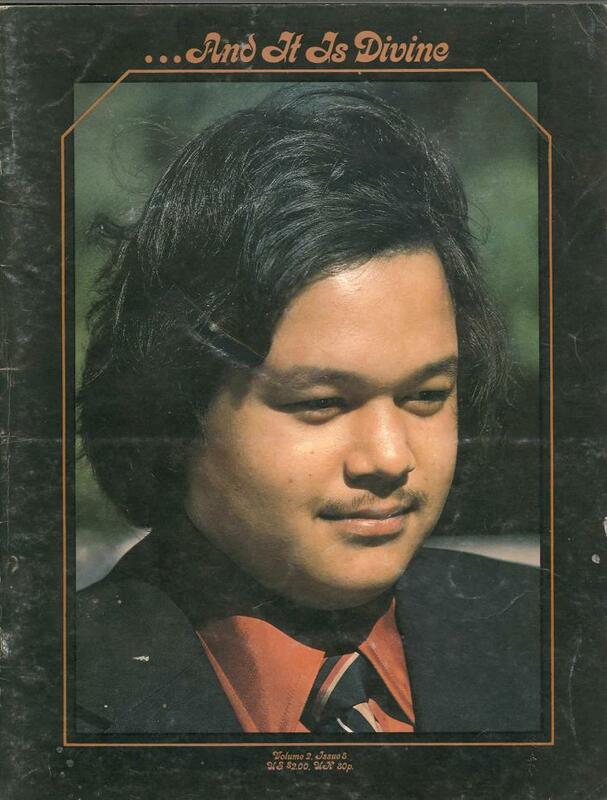 It began as a monthly magazine attempting to carry a wide spectrum of articles relating to the wider alternative culture with highbrow pretensions and ended the same as all other Divine Light Mission magazines printing pictures and speeches of Prem Rawat's or his immediate family or close followers. So now I think the best thing to do is to have everyone come up and have the darshan of Guru Maharaj Ji, to do pranam at his feet, and realize what he's truly giving us in this moment. Because, really, as you go to do pranam you're the most fortunate human being in this world. Thank you. On their return to the States, premies organized Divine Light Dance Ensemble and began work on the Krishna Lila. Seven months later, at Guru Puja '72, Maharaj Ji saw the dance performed for the first time. After changes had been made in it by him, the troupe took Krishna Lila on a tour which included a performance at the United Nations, and ended in New Delhi at the Hans Jayanti celebration before hundreds of thousands of premies. O my Satguru, all praise to you, all glory to you! 0 Lord of the Universe, source of all creation, supreme personality, bestower of salvation, friend of the humble and the poor, only by your blessing can this powerful illusion be dispelled, as the sun's rays dispel darkness. 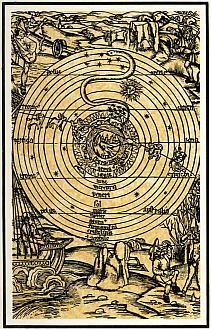 That, in a nutshell, is the difference between a man who merely has an education and a man who has learned how to use it; and it exactly parallels the difference between the man who merely has the Knowledge and the man who actually meditates. I was in Denver and finally I got the chance to be able to go through the whole organization, the subsidiaries and everything. It's so amazing. I mean, it's terrific. The potential of premies is too much. It's even too much to imagine what they can do. It's like an overnight job. See, this is the thing here: one and one usually make two. But not here. One and one make eleven. When it's a case of premies, one and one make eleven. The recent discovery of electricity was thought to be the secret of life, the life-force itself (it was no coincidence that the novel Frankenstein was written at this time), and Beethoven's music was called 'electric', touching men deep within with a strange force and power. In the course of one momentous decade, 1800-1810, he turned music upside down, breaking out of all previous musical concepts in his efforts to express something more real and vibrant. But while the tyrant Tadodaho still controlled the Onondagas, the most powerful of all the tribes, the League had no chance. Deganawida told Hiawatha that he must learn to love even those he might have feared and hated most; the time had come to confront Tadodaho directly. The tyrant is said to have looked like a monster, twisted in mind and body, with thoughts so evil they grew out of his head as snakes. Deganawida and Hiawatha approached him lovingly, singing. With haughtiest contempt Tadodaho had watched Hiawatha slinking off into the forest after the murder of his last daughter. By the Grace of Guru Maharaj Ji we have realized a very important thing. All of us. And after realizing it, I hope most of us have gone on that path and tried to meditate, and tried to experience the love, the harmony from it. The mind is unique. It's faster than everything. You can't compare it to anything. 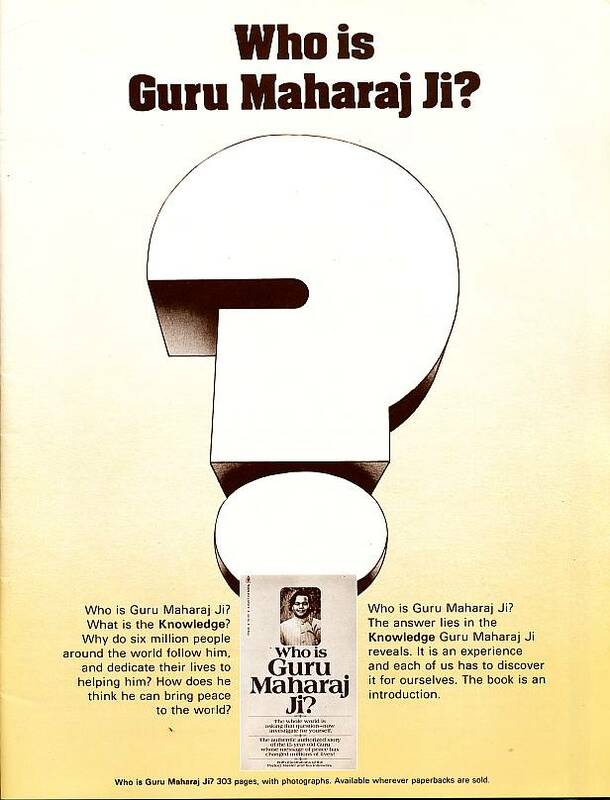 And because it's unique, the unique Knowledge of Guru Maharaj Ji tries to control it. Tries. Because if we do enough meditation, it will stop it. But if somebody doesn't do enough meditation, his mind goes very much against Knowledge. If you don't try. In reality the glories of Guru Maharaj Ji cannot be described. By simply remembering Guru Maharaj Ji, all difficulties go away and for this reason all saints and mahatmas salute Guru Maharaj Ji first. When in the heart of a disciple the nails of Guru Maharaj Ji's feet start shining like pearls, then he has divine vision by which the darkness of ignorance is removed. "Once you receive this Knowledge your heart leaps and is so much filled with devotion and love. Love, not towards this materialistic world, but love towards God, who is your real Father whom you have forgotten and whom you must realize." Many thanks to those who made these texts available for publication on the internet.